Eden is an amazing artist! Not only are her hair and makeuo skills beyond magical, but she was able to put us at ease and had us laughing and joking around throughout the hectic getting ready process! Just 6 days after getting engaged in October 2015, I was diagnosed with breast cancer. Aside from worrying about my health and treatment, I (like many) also worried about losing my hair due to chemotherapy. Eden came highly recommended to me because not only is she great at what she does, but she also has experience with wig styling. After meeting at her apartment for my hair/makeup consultation, I instantly felt more confident that I'd still be a beautiful bride. She understood my situation, and more importantly, understood me. She also did a fantastic job with my makeup, making the most of my poor little eyelashes and eyebrows that were still making a comeback. 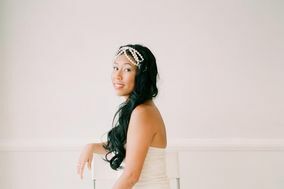 Even though I was initially worried about not feeling/looking like myself on my wedding day with the wig, false eyelashes, etc, Eden's easy way of working and professionalism helped me feel relaxed -- I knew I was in good hands and could just let go, trust her and enjoy the getting ready process. Truthfully I had never thought about the "wedding hair of my dreams" until I realized I wouldn't have any. But thanks to Eden, I love the way I looked and am so thankful I had her for my wedding. XOXO! Eden is THE hair and makeup artist you want by your side the morning of your wedding. Not only does she do beautiful work, she's super friendly and chill. Within 5 minutes, she feels like an old friend - an old friend that can make you look red carpet ready! She's easy to communicate with leading up to your big day and great about accomodating last minute changes to the list of who is getting what done. I had a pretty low-key/budget-friendly wedding, but I still wanted to have someone else do my hair because I just didn't want to deal with any of that added stress. I would have gone to a salon and gotten a regular updo, but my wedding was during the day - Sunday lunch at the Brooklyn Winery - so all the salons were closed when I would have needed to go (like, 7am Sunday morning). I emailed several vendors explaining my situation (just me, no bridal party, getting ready at my apartment, just want an updo and maybe a scootch of makeup), hoping to find someone who really believed me that no, I didn't want airbrush (or any) foundation, no thanks to a touch-up kit, hard pass on the frozen-in-place updo, etc etc. I really just wanted to feel like myself, but better - I refused to look unrecognizable or overly gussied on my wedding day. Out of everyone I emailed, Eden was the one who really got it. I thank my STARS that she was willing to work with me because I don't know what I would have done otherwise! I did a trial with Eden at her house, and she came to my house for the (very early) morning of. From first meeting to final hug, I felt so relaxed, welcomed, understood, and taken care of - and her sweet bubba of a dog at her apartment didn't hurt! She absolutely nailed what I was going for - a wavy-haired braided half-up situation that wrapped around a greenery crown (which she also MADE BY HAND for me that morning), plus fake lashes because mine are like translucent-blond, plus just a dab of undereye stuff. I added in my own blush and brow pencil and was RTG. She made me look, and more importantly, FEEL like a million bucks - just like myself, but enhanced. At the reception I was drunk on wedding-buzz and kept grabbing my friends and telling them how bomb gorgeous I felt. They all very kindly agreed : ) She was my biggest category splurge in our overall very budget-conscious wedding, and it was worth every. single. penny. I truly can't recommend her enough. Prior to the big day, Eden was really easy to communicate with regarding my hundreds of questions and updates. She worked with me to come up with the best wedding day look, and I was really happy with my trial. I had never felt more beautiful, while still not feeling like I had makeup caked on me. She truly put me at ease, and allowed me to enjoy the pampering. I can not say enough wonderful things about Eden - she is SO talented, and such a joy to be around. She was such a pleasure to work with, and I have been singing her praises to everyone I talk to about makeup and hair services. You can't go wrong with hiring Eden - she is simply the best!! Eden did a fabulous job on my makeup for my shower and wedding! We did the trial in the morning right before my shower, so I was able to see how everything wore throughout the day. After making a few tweaks from the shower trial, my wedding makeup came out perfect! Eden is truly a skillful makeup artist. I received countless compliments on my makeup, particularly my eyes. Part of the reason I chose Eden is that she only uses cruelty free products. However, Eden only uses incredibly high quality products - you can be kind and still look amazing all day long. Additionally, at my trial, Eden also recommended a skincare regimen that had me looking my best by my wedding day. In addition to being super talented, Eden is also upbeat and fun to work with. We became fast friends throughout the wedding planning process. I would recommend her to anyone, vegetarian/vegan or not. Eden came highly recommended by my month-of coordinator, and after our first meeting I understood why! Eden is so friendly and easy to work with, she put my anxious mom at ease and we laughed and talked the entire way through my initial trial. On my wedding day (5/24/15), Eden and her assistant arrived promptly at the hotel and got right to work. My three bridesmaids couldn't stop talking about how amazing their makeup looked (and that gorgeous mermaid hair!) and my mom was also very pleased. Eden did an incredible job with my own hair and makeup (she secured my heavy hairpiece perfectly, it didn't fall out once, even when I was being dipped!) and was a very calming presence the morning of my wedding. I would highly recommend Eden to any bride-to-be!! My husband and I travelled from our home in Australia to get married in NYC in December 2014. Our photographer recommended Eden from a one off experience she had had working with her. I checked out Eden's website, photos and reviews and thought "cool, she sounds great, please let her be free!" I wasn't disappointed! Eden was so easy to book and communicate with from the other side of the globe. She came to our hotel room armed with everything she could possibly need and worked her magic on me. I was so happy with my hair and make up! Our photos were stunning and I felt unusually beautiful. On top of this, she was hilarious! (Actually, even her emails had me chuckling - so quick witted). We eloped because we wanted an easy going wedding. I had the best wedding ever! So much fun! I would definitely recommend Eden for anyone who's after a hair/make up artist; not just for her talent and abilities but for helping to make our day a memorable, fun and relaxed one - every bride needs an Eden. Eden is amazing! Not only is she a super talented hair and makeup artist (and uses cruelty-free products to boot,) she also has an awesome personality and will keep you laughing and relaxed the whole time you're getting ready! She was able to make my sometimes problematic skin look perfect, the fake lashes were subtle, and my hair lasted all night long. Eden is crazy nice and even helped us put new boutonnieres together when we found the ones we made the day before had wilted! What can't she do? Hair. Makeup. Emergency flowers. Wedding party wrangler. I was super happy with my hair and makeup for both my trial and my wedding day! Eden did an amazing job at creating a hairstyle for me based on several ideas I brought to her. And as I am not one to have great make-up ideas, she took over and made me look beautiful! Eden also accommodated the requests of my wedding party and everyone was happy with their look! She has a lovely personality, is so friendly, sweet, and fun to be around. Eden was very responsive to my emails and calls and was flexible with our scheduling (we got married early in the morning). I highly recommend her for your wedding day or any day you just want to look amazing!! I eloped in New York in October 2014 and was lucky enough to have Eden do my hair and makeup. She came to my hotel room for a trial and listened to exactly what I wanted and experimented with different hair and makeup styles to find what suited me and what I felt most comfortable with. I couldn't have chosen a better makeup artist. Eden was friendly and warm and I felt really comfortable the whole time. On my actual wedding day she was on time and helped to calm my nerves. Overall she helped to make the whole getting ready process a wonderful, fun experience. The makeup in my photos turned out beautifully. I wouldn't hesitate to use Eden's services again, I highly recommend her. Just fantastic service the entire wedding day, and so much fun getting dolled up!